Built for the extreme RV environment. One-touch test/reset button. Alarm can be muted during ventilation, but will re-alarm if hazardous conditions recur. Alarm Point <25% LEL of Propane and Methane. 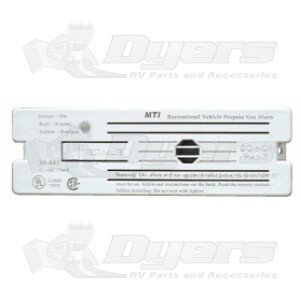 Meets requirements set by RVIA for LP Gas Alarms on RVs. Test/Reset Button - Mute alarm during ventilation. Tests all detector functions with one touch. No dangerous gas required. Alarm is fully operational during mute cycle and will realarm if hazardous conditions recur. Operating Temperature -31°F to + 150°F (-35°C to +66°C). 6"W x 1-7/8"H x 1-1/2"D.